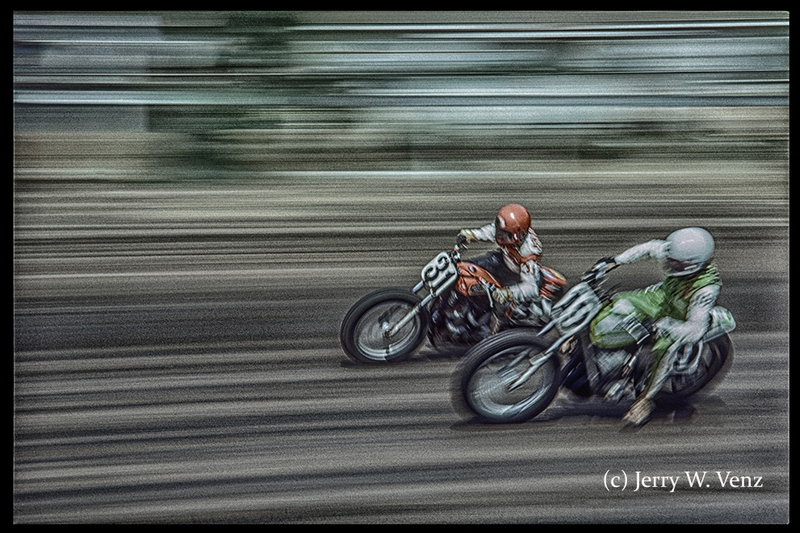 There are basically two ways to photography fast action and motorsports. You can freeze the action at the decisive moment giving your audience a detailed look at a moment that can’t be seen in real time, or you can create the illusion of motion in a single frame by NOT freezing the action. These two styles each have their place. The stopped action style is what you mostly see in reportage photography media. I think not freezing the action, implying motion, can elevate your action sports images to the next level; they can become art. Both styles are the result of diametrically opposed techniques, but it’s all about Shutter Speed. Of all the motor sports I’ve done over the years, I loved doing motorcycles the most. You can see the racer doing battle with the pitching and sliding race bike and it’s easier to get more than one racer inside the frame just because they’re smaller than their four wheeled counter parts! Too often today I see stopped motion photos of single race cars where the car just looks parked on the race track! The technique that must be practiced to capture race bikes doing 100 mph, at slow shutter speeds, is Panning with the Action. To do this you must start with your camera pointed towards where the race bike is coming from and as it goes by you match your body rotation to it’s speed, clicking the shutter when it’s at it’s closest point, in front of you, (when the bike is parallel to your camera’s “film plane”) and follow through—panning as it goes by. 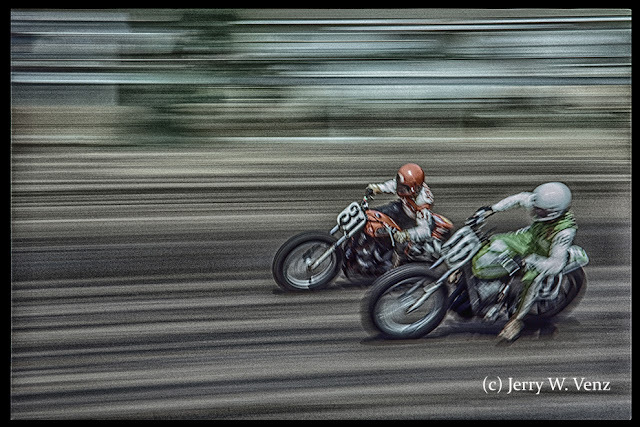 When I did this image of these dirt trackers, on the San Jose Mile, back in 1970, I did not have auto focus or motor driven film advance, so I got ONE image every time the bike(s) passed-by. I manually focused on the track at that closest point where each particular racer tended to be; professional racers are very consistent about maintaining the same “line” on each lap. So, this focusing technique works well. Nowadays it’s a bit easier; we just put our auto focus into AI-Servo mode and shoot at 5 to 10 frames per second as the racer flashes by. But it’s still up to YOU to do the panning smoothly. As you can see the slow shutter speed pan is great at isolating the race bikes by totally bluring the often distracting backgrounds you have at racetracks. For action subjects that are chaotic (you don’t know where they are going to go) or action that is moving away or towards you the slow shutter speed pan is useless. That’s when you crank-up the ISO and go to high shutter speeds. There aren’t too many other sports more chaotic than a rodeo! You never know where the horse or bull is going to go when the gate opens…and neither does the cowboy! 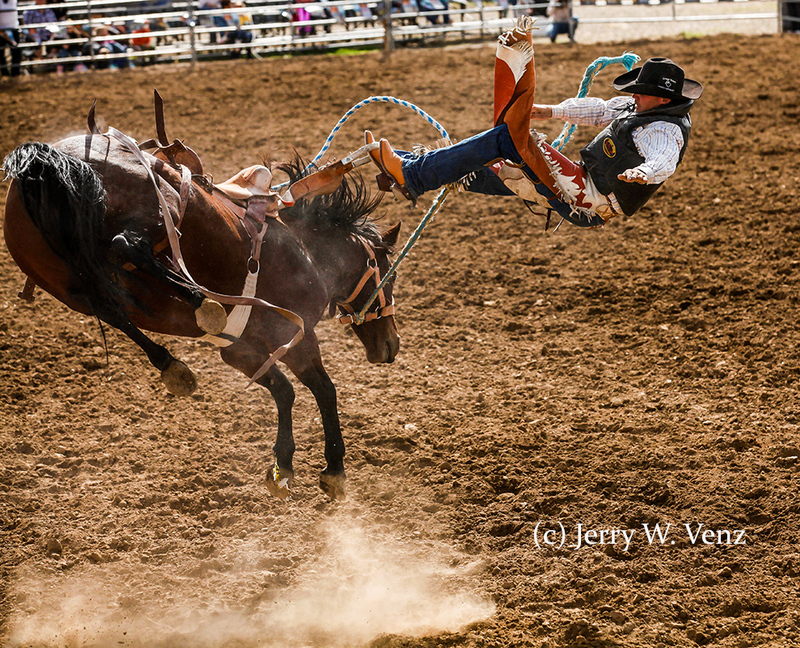 You’ll notice a couple of things in my exposure data for this rodeo image that is different than what I see other photographers suggest for action shutter speeds and f-stops. I see many photographers suggest you use 1/1000 sec., as your shutter speed, but I’ve found for the intense action of rodeo I get a higher yield with must faster shutter speeds. So, I’m usually at 1/2500 sec. to 1/5000 sec. to really stop action. In addition I tend to keep my f-stops from f4.5 to f5.0 for two reasons: First, I want only my subjects sharp and I’ve found that with my lens @ 200mm f5.0 gives me plenty of depth of field while defocusing the background. The Second reason is sharpness; most lenses are not sharpest when wide open—so I rarely have my lens at it’s widest aperture ( f 2.8 ). Those are the basics that I’ve found produce the greatest yield in this kind of photography. The key to really mastering sports photography is attaining experience through Practice, Patience and More Practice!